Americans are bombarded – by the news and their government representatives – with the fact that foreign countries owe us a lot of money. We’re also told the reverse, too, which is that we owe foreign countries a lot of money. But do you know the real facts about who owes who, and how much? It might surprise you to know that America is owed a lot more money than it owes. Despite substantial debts that America owes to countries like China and Japan, they owe us money as well. It’s not just the amount of money that America owes that has her citizens so concerned, either. A big part of this discussion is who American owes money to. For a long time, the biggest holder of U.S. debt was China. But did you know that in late 2016, Japan overtook China as the biggest foreign holder of U.S. debt? Japan and China are, by far, the two biggest holders of U.S. debt – but the top five is filled with countries that you might not expect. How about Ireland, the Cayman Islands, and Brazil? Did you expect them to be substantial holders of U.S. debt? Then there are the countries that owe America money. Even though Japan holds the biggest amount of U.S. debt, the U.S. is also owed a lot of money by them too. Debts and investments are reciprocal relationships. Debts are often created as a natural part of doing international business. So they aren’t always as big, bad, and scary as people make them out to be. 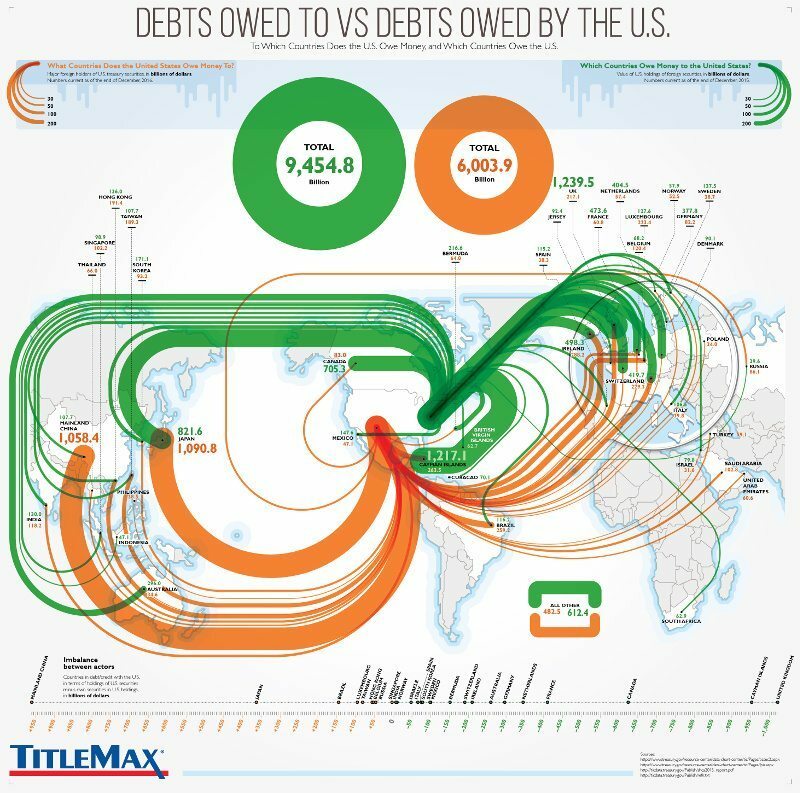 The situation is more complicated than you might expect – so we’ve taken the liberty of mapping out US foreign debts! Using this infographic, you can see which countries owe the U.S. money, which countries the U.S. owes money to, and the total amounts. We’ve also broken down the “difference between actors,” which represents the difference between how much America owes and how much it’s owed. Get the facts for yourself right here!